Cobras are venomous snakes found in Africa and Asia. All 28 species of true cobras belong to the genus Naja. They have round pupils and smooth scales, and can grow to 6 feet long. When threatened, cobras hiss loudly while raising the front third of their bodies. They spread their necks in an effort to appear larger. 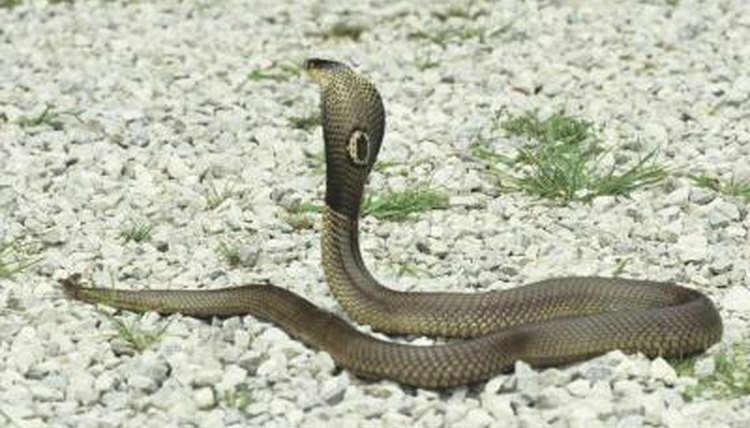 Other snake species displaying hooded necks, upright bodies and loud hissing are often mistakenly identified as cobras. Oriental rat snakes are found throughout India. Although non-venomous, many people mistake oriental rat snakes (Ptyas muscosus) for cobras because they're aggressive and hiss loudly before delivering a painful bite. Colored in shades of brown or green, they're identified by stripes on their underbellies, vertical stripes below their eyes and dark lines below their lower lips. Oriental rat snakes have pointed heads, unlike the cobra's round head, and they're larger than cobras, reaching up to 12 feet long. Black mambas inhabit eastern and southern Africa. Brown in color, they're named for the black coloration inside their mouths. Sometimes mistaken for cobras, black mambas (Dendroaspis polylepis) are lethally venomous. Like cobras, they will raise the upper third of their bodies, spread their hooded necks and hiss when they're threatened. Unlike cobras, they may be 14 feet long, and they're extremely fast, traveling at speeds up to 12.5 miles per hour. Eastern hognoses are harmless snakes that rarely bite. Small and stocky, eastern hognose snakes (Heterodon platirhinos) are less than 3 feet long, with rough scales, dull colors and upturned noses. They also raise their bodies, spread their necks and hiss loudly when they're disturbed. If this doesn't frighten their enemies, they will roll onto their backs and play dead, even going so far as to hang their tongues out of their mouths. Although named for cobras, king cobras are not true cobras. They belong to the genus Ophiophagus. Like true cobras, a single bite from a king cobra (Ophiophagus hannah) delivers enough venom to kill an adult elephant. King cobras can be 18 feet long. Although they will stand tall, flaring their hoods and hissing as they fiercely defend themselves when cornered, they are shy snakes and aren't normally aggressive.